AMY GOODMAN: But I wanted to turn to what happened Tuesday night when we talked to Carol Anderson, chair of the African American Studies Department at Emory University, author of One Person, No Vote: How Voter Suppression Is Destroying Our Democracy. Of course, she was in Atlanta, where Stacey Abrams was. It was in the midst of the very close count. 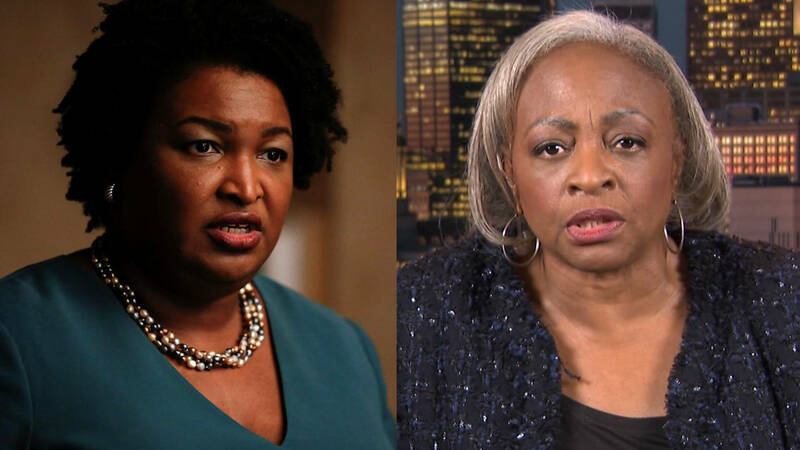 We still don’t know what will happen, because Stacey Abrams has said she will not concede at this point. I asked Professor Anderson about Georgia Secretary of State Brian Kemp’s lead over Stacey Abrams in the race for governor. CAROL ANDERSON: One of the things that I’m really seeing when I think about Georgia, frankly, is the power of voter suppression. And I’m listening to this conversation about the weaknesses in the Democratic Party and that it should be a landslide. But what we’re not taking into account is that you get more votes—I mean, we got more votes in the 2016 election. And when we’re—and Trump won. When we’re looking at what we’re seeing right now, is that the number of votes that it takes, because of the massive gerrymandering that we have going on, it still is part of that thing where it requires a blue tsunami in order to get a blue trickle. And we need to have that as part of our analysis. When I look at what’s happening here in Georgia, we cannot forget that Kemp purged in the last two years 10.6 percent of the registered voters in Georgia off the list. We cannot forget that he closed 214 polling places, most of those in minority and poor neighborhoods. We cannot forget that Kemp has held in abeyance, in this round alone, 53,000 registered voters, 70 percent of whom were African-American. So, as we begin to look down and drill down into those numbers—and that’s the analysis that we did not get immediately coming off of 2016, is: What does it mean when we depress the vote by doing massive voter suppression? That is absolutely a key element in what we need to be thinking through. The ground game that Stacey Abrams had is phenomenal—there is no question about it—knocking on every door, doggone near, going to 159 counties. But we see the politics of fear versus the politics of hope, the politics of change. And we see—I mean, and when I’m looking at the results coming in throughout the nation, on one hand, you get these incredible victories of a Palestinian woman becoming a member of Congress, at the same time where you get Ted Cruz winning. And so, you’re looking at a nation that is fissuring, as you’re getting the wants of the people being diverted and sidetracked via fear and via voter suppression. You’re looking down in Florida, and DeSantis is a weak candidate. But we also have to think about what the politics of fear—the politics of fear is real in American society. This is why you see the Republicans, like Donald Trump, doubling down on it, particularly driving white fear, this fear that the demographic change happening in America, as envisioned and embodied in Andrew Gillum, as envisioned and embodied in Stacey Abrams, may be just too jarring and too threatening. Kemp was one who talked about, late in the campaign and during the debate, and riding on the issue of the caravan, that what Stacey Abrams really wanted to do was to bring all of these “illegals”—and I hate that term, but he meant it the way he said it, what is to create an other, to dehumanize people—to bring all of these “illegals” into Georgia to vote, to steal the election away from these hard-working—which is coded “white”—Georgians. We’ve got to understand the power of that. And that power, frankly, for so many—too many—is more powerful than what looking at these individual issues mean. They know what it means when you don’t have water. They know what it means when you don’t have healthcare. But it is that power of fear. That’s the work that has to be done. And that’s—you know, Rashad talked about the need to have those kinds of conversations happening within the white community. That is some of the groundwork that must happen, so that we can begin to see the kind of America that we really deserve. AMY GOODMAN: That’s professor Carol Anderson, chair of the African American Studies Department at Emory University in Atlanta, speaking last night from Georgia. Early this morning, Stacey Abrams vowed to remain in the race. STACEY ABRAMS: Democracy only works when we work for it, when we fight for it, when we demand it. And apparently, today, when we stand in lines for hours to meet it at the ballot box, that’s when democracy works. But I’m here tonight to tell you, votes remain to be counted. There are voices that were waiting to be heard. Across our state, folks are opening up the dreams of voters in absentee ballots. And we believe our chance for a stronger Georgia is just within reach. But we cannot seize it until all voices are heard. And I promise you tonight, we’re going to make sure that every vote is counted, every single vote, every vote’s been counted. AMY GOODMAN: That’s Stacey Abrams. Thousands of votes have yet to be counted. And again, if during this count Brian Kemp dips below 50 percent of the vote, there will be a runoff race in December. This is Democracy Now! When we come back, Alexandria Ocasio-Cortez speaking to Democracy Now! from Queens, where she gave her victory speech. Stay with us. AMY GOODMAN: George Michael’s “Freedom! ’90,” performed at last night’s victory party for Alexandria Ocasio-Cortez in Queens, New York. She became the youngest woman in the U.S. House of Representatives ever—she will be.